In 2011, McKinsey Global Institute called Big Data “the Next Frontier.” That was then; now, Big Data is so much a part of life, it’s not frontier – it’s everyday. Professionals in Big Data may be called data scientists, data analysts, information engineers, or any one of a number of different titles. The U.S. Bureau of Labor Statistics (BLS) classifies these workers as statisticians, computer programmers, or in other occupations, depending on their tasks. In fact, the work of the BLS is in itself a fine example of Big Data at work! Big decisions rely on Big Data. Also note, Linkedin, the massive professional network, ranked business intelligence, data mining, and data engineering – all Big Data skillsets – among the 25 hottest skills of 2015. These trends are only growing as the needs for data scientists in the fields of business, finance, government, healthcare, social networking, and technology, continue to evolve. In 2012 alone, the BLS data for numbers of employed statisticians and computer programmers were 25,570 and 316,790 respectively, with a median annual wage of $75,560 and $74,280, respectively. These numbers are more than double the median annual wage of $34,750 for all workers in 2012. And that was five years ago, when no one had heard of Big Data outside specialist circles. While these degrees are highly specialized, they are also highly sought after. As the schools profiled in these rankings describe, many of them are all-inclusive, providing tools, knowledge, and networking opportunities for students to secure a very lucrative career in many fields. So bring your problem-solving, communication, teamwork, and curiosity and put them to work for you, with this small but growing group of mathematicians, statisticians, and computer scientists. Together, you will help solve the world’s data storage, access and marketing needs, one data set at a time. 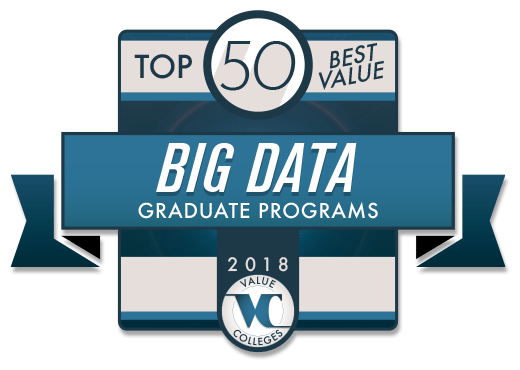 If you need the flexibility of an online degree, take a look at our ranking of the Best Value Top 50 Online Big Data Programs for 2018. One of the most revered post-secondary institutions in the United States, Stanford University is officially known as Leland Stanford Junior University, and colloquially named The Farm. Established in 1885 by Leland and James Stanford, in memory of their only child Leland Jr, who died in the typhoid fever epidemic at age 15. Currently, Stanford is known as the most highly selective undergraduate program in the nation, and has often been called the world’s most prestigious university. Some of the forces that strengthen the draw to this highly acclaimed school is the close proximity to the SIlicon Valley, as well as their academic contribution. Stanford University offers some of the most prestigious graduate programming in the country, including Stanford’s residential Master’s of Science in Statistics: Data Science, which is a response to the escalation of Big Data’s influence on the disciplines of engineering and the applied sciences. The program is offered through the Department of Statistics and ICME (Institute for Computational and Mathematical Engineering), as they have teamed up to create this ground-breaking computationally informed program to build experts in the the fields of Big Data. Graduates of the program are well positioned to enter the corresponding P.h.D. in Statistics, ICME, MS&E, or Computer Science. The University of California, San Diego, which is also referred to as UC San Diego, and is a public research institution situated in the La Jolla neighborhood of San Diego on 2,141 acres beside the Pacific Ocean. Originally they were founded in 1960, beside the Scripps Institute of Oceanography. UC San Diego is the seventh oldest of the ten University of California school, and has an enrollment of about 28,000 undergraduate, and 7,000 graduate students. One exciting fact about UC San Diego, is that between the faculty, alumni and researchers, twenty Nobel prizes have been awarded cumulatively, as well as eight National Medals of Science, eight MacArthur Fellowships, two Pulitzer prizes, and three Field medals. The University of California, San Diego residential graduate degree programs span many fields and casts a wide net professionally. The Master of Advanced Study Degree, in Data Science & Engineering at UCSD is an interdisciplinary course of study that converges database management, software programming, and statistics to create efficient and effective ways to identify date-driven trends, and create computational models of data. The other key component that the program embeds are the skills to present findings in visual and accessible ways, making the research digestible by larger populations. This program is taught by expert UC San Diego faculty, and is offered on an alternating weekend schedule Fridays and/or Saturdays, for student accessibility. The classes are intimate settings, allowing for deeper collaboration within cohorts, and can be completed in as little as two years. The course of study culminates with a capstone design project done in teams. The University of California, San Diego offers a Master’s of Science in Business Analytics Degree program, through the Rady School of Management. This residential graduate program offers students the critical skills for successful engagement in today’s world business strategy, and analytics. There are many opportunities in this course of study for diligent experiential learning that gives students the skills to identify solutions to large scale business related issues and generate groundbreaking insights that are essential to the success business operations. Coursework also prioritizes effective and ethical communication skill building, and team management. Graduate receive extensive career support from Career Connections, with personal coaching and programs and resources. Saint Joseph’s University, also known as SJU, or St. Joe’s is a private university a Roman Catholic, Jesuit foundation, and is situated in the Greater Philadelphia Metropolitan area, on the historic Philadelphia Main line, in Lower Merion Township. Founded by the Society of Jesus in 1851, with the original name of Saint Joseph’s College, it is the seventh largest Jesuit college in the country. Enrolled are over 9200 undergraduate students, graduate and doctoral students through the Erivan K. Haub School of Business, the College of Arts and Sciences, The Program of Professional & Liberal Studies, and Haub Degree Completion Program. The Haub School of Business at St. Joe’s offers a well respected residential Business Intelligence and Analytics Master’s of Science program, and has made a name for itself by creating leaders in Organizational data analysis, strategy, and decision making. The program is STEM designated with an option of being completed on a full or part-time basis. Recently, the program was rated one of seven of the best master’s programs “for the tech inclined,” by inc.com. They have also consistently been ranked by the Princeton Review and the US News and World Report ranking. Applicants must submit undergraduate transcripts, a personal statement, a resume, standard letters of recommendation, and GMAT or GRE scores. Texas A&M University, also known as TAMU, or A&M is a public research institution located in College Station, Texas, and is a member of the Texas A&M University System, with an endowment that remains one of the 10 biggest in the country. They are designated a land, sea, and space grant university; the only school in Texas to have all three designations. They’re student population is one of the largest in Texas, and also one of the largest in the country. The main campus also makes the record of largest, as it is on 5200 acres, making breaking national records for campus size. The main campus is home to the George Bush Presidential Library. Texas A&M offers what is known as an extremely competitive residential Master’s in Analytics program. They seek only the strongest candidates who apply with competitive GPAs, and/or GRE or GMAT Scores. They are also looking for candidates with a statistics background, and have successfully completed at least one statistics course with an A or B grade. They are also seeking students for their program who have relevant work experience under their belt, with a minimum of three years at a full-time capacity, and with organizational support from an employer that can carry from the workforce back into the graduate program. Boston University, Metropolitan College, also known as MET, is one of the seven four-year degree granting schools and colleges under the Boston University umbrella. Since 1965, when it was established, they have offered a variety of part-time programming formats, from evening study, to today’s popular online and hybrid programs. Of the Metropolitan College campus full-time faculty, 94% have earned doctoral degrees. US News and World Report Ranked This institution as #4 in Best Online Graduate Criminal Justice Programs, #4 in Best Online Graduate Information Technology Programs, and #10 in Best Online Business Programs (excluding MBAs). The United States Distance Learning Association (USDLA) awarded MET the 21st Century Award for Best Practices in Distance Learning. Boston University Metropolitan College offers a residential Master of Science in Computer Science with a concentration in Data Analytics that addresses some of the foundational Big Data questions and innovations of our time. Students will be given the skills and resources to investigate and communicate data processing, analysis, and visualization. Graduates of the program will have cutting-edge data analysis and relevant application skills, have the necessary practice applying a variety of data visualization techniques to the explanation of real world data sets, and a firm background in web analytics and metrics. There are three program start dates in September, January, and May of each year. The University of Virginia, which is often referred to as UVA or simply, Virginia, is a public research University that is also the flagship for the Commonwealth of Virginia. It was established in 1819 by Thomas Jefferson, the author of the constitution. There is lore attached to student culture at UVA, as they are the home of secret societies and a student-run honor code. They are also the host of several historical foundations. UVA was designated as the first and only collegiate World Heritage Site in 1987, by UNESCO. Located in Charlottesville, students come from all 50 states and 148 countries to attend. Among UVA’s exciting graduate offerings is a residential Master’s of Science program in Data Science. The Data Science institute at UVA holds this exceptional program geared towards lovers of organizing and putting to use large quantities of data, while applying them to real-world scenarios. This professional program spans 11 months, starting in July and coming to completion in May, and therefore, is as rigorous as it is fast-paced. The interdisciplinary coursework is taught by core faculty from the Statistics, Computer Science, and Systems and Information Engineering Departments. There are many opportunities for experiential learning, and the conclusion of a capstone project that brings students into professional environments ripe for real-world skill building. The University of Michigan at Dearborn, also known as UM-Dearborn, or UM-D is a public research institution situated in Dearborn, Michigan. There are three University of Michigan campuses, the other two being Ann Arbor, and Flint. Graduates of UM are part of the largest alumni organization of it’s kind in the entire world, The University of Michigan Alumni Association. There is a great deal of collaboration among students, faculty and researchers between the three campuses. UM-D offers 90 undergraduate academic majors, 28 Master’s programs, and 3 doctoral degree programs. UM-D is a known active member in the Coalition of Urban and Metropolitan Universities. The University of Michigan-Dearborn’s College of Business offers a well-respected Master of Science-Business Analytics program, designed to give students a holistic skillset to create effective and accountable business plans, by interpreting and applying the outcomes of in-depth data analysis. The Financial Engineer just rated this program #28 in the US. This residential graduate program can be taken with full or part-time status, during the fall and winter semesters, with the possibility of coursework in the summer months. Admission is granted on a rolling basis, and students have the opportunity to begin in September or May, with the possibility of a January start date for part-time students. The University of Iowa, also known as UI, or U of I, or even just Iowa, is a flagship public research University, located in Iowa City, Iowa. Established in 1847, it is officially the oldest university in the state, and is currently the second largest university in the state, the largest being Iowa State University. The campus is on an urban 1,700 acres, on the banks of the Iowa River. Carnegie Classifications has designated UI as a Doctoral University, with Highest Research Activity. An interesting fact is that IU was the founder of the Master of Fine Arts degree, and it is known for being the home of the internationally renown Iowa Writer’s Workshop. They were also the first to recognize an LGBT organization of students on campus. The University of Iowa offers a residential graduate program in Business Analytics. The program is driven by the premise that they are offering the most currently in demand skills, as the fields requiring skilled data interpreters are growing exponentially. They offer both a certificate program, as well as the Master’s of Science degree. A GRE is not required for either program. The course of study requires 30 credit hours by way of ten, 12 week classes, with no Friday or weekend in-person requirements. The program is to be completed in a three year period. University of Iowa graduate students are waived from paying the one-time university fee. The University of Florida, also known as UF, or simply Florida, is a public research institution classified as very high research with public land, sea, and space grant status. The breathtaking campus spans 2,000 acres of land in Gainesville, Florida. Measured by student population, UF is the third largest campus in the state. Established in 1853, governor Thomas Brown signed a bill that accessed public funding for the health of the university. In 2016 the US News and World Report ranked UF’s Engineering School 38th nationally, and in 2017, they ranked the University of Florida as tied for the ninth best public university in the US, and tied for 42nd overall, among all national public and private universities. University of Florida offers a residential graduate program, with a degree outcome of Master’s of Science in Information Systems, and Operation Management (ISOM). This professional program prepares students to flourish in the world of Big Data. An exciting fact is that 100% of domestic graduates of the program in 2016, were immediately given full-time positions, with salaries beginning at 55-110K annually. The program is STEM accredited, which excites employers. Apparently, it is not uncommon to find recruiters from consulting firms and government agencies, as well as industry firms engaging students in the on campus building Hough Hall in search of talented new employees. The University of Minnesota-Twin Cities is often referred to as The University of Minnesota, the U of M, or casually just the U. This university is a public research university located on two campuses, one in Saint Paul and the other Minneapolis. The campuses are a mere 3 miles apart. The Saint Paul campus is the oldest and largest within the University of Minnesota system, and has the sixth largest student body in the US, with total enrollment of 51,147 in 2013-2014. An exciting fact is the faculty, alumni, and researchers have won a total of 25 Nobel prizes, and 3 pulitzer prizes. The University of Minnesota offers a Master’s of Science in Data Science program, considered a “New Degree for the Modern Digital Age.” This residential graduate program gives students the fundamentals of data analytics, management, and communication skill and strategy. The traditional full-time student will complete the program in two years, with 31 credit hours. Each student will complete a comprehensive project, showing that they have grasped concepts relating the applicable use of big data in a real world professional scenario that can be applied to a myriad of disciplines. The students of the program recently participated in the inaugural Data Science poster fair. The Carlson School of Management at the University of Minnesota Twin Cities offers a residential Master’s of Science in Business Analytics. This is a full-time graduate that pairs the concepts of data analysis, with critical business information. Offered are foundational business literacy classes with embedded comprehensive data analysis skills, and the necessary skillset development of problem solving and analytic methodology. The program consists of a 45 credit hour requirement, which can be accomplished in three fast-paced rigorous semesters. Students are given hands-on opportunities to work in the context of real world problem solving, which may include consulting with actual business clients. Bentley University is a private institution with a business focus. It was established in 1917, as a with a distinct focus on finance and accounting. Bentley is situated nine miles west of Boston, in Waltham, Massachusetts, though when it first opened it’s doors, they were located in the Back Bay neighborhood. They offer high quality focused degree programs, including 11 distinct Business related Bachelor of Science programs, and six Bachelor of Arts degrees. The US News and World Report has ranked Bentley University second in the Top 10 Master’s Universities in the North, and Top 50 Undergraduate Business Programs in 2017. Bentley University’s MCcallum Graduate School of Business offers the highly revered Master’s of Science degree in Business Analytics. This program was designed as a training ground for the prospective 2 million data analytics jobs that are and will be created in the coming years. This residential graduate program answers the call of the industry by giving students the complex skills to break down Big Data, into manageable information by building competencies in statistics, economics, data science, management marketing and finance, and information management. There is a full time and part time enrollment option, and candidates are chosen based on their whole package including: work experience, learning objectives, and test scores, as well as the general application. Seattle University, colloquially known as SU, is located in the First Hill Neighborhood of Seattle, Washington. It is a private Jesuit Catholic School and is one of 28 member institutions of the Association of Jesuit Colleges and Universities. Enrolled are almost 7,500 students within nine schools and colleges. The Wall Street Journal/Times Higher Education College Rankings 2018 placed SU #2 in the Northwest overall and as the top-ranked private university in the Northwest. Seattle University was ranked #7 among the West’s best regional universities, according to the 2018 U.S. News & World Report “Best Colleges” rankings. One of the exciting residential graduate programs that Seattle University has to offer is the Albers School of Business and Economics Master’s of Science in Business Analytics. Full-time students can complete the program in just one year’s time. Entrance is offered once each fall. Prospective students must complete the following prerequisites prior to the start of the program: Statistics, Business Calculus, and Computer Programming, all of which can be waived with proof that a similar class has been taken. Graduates will have key competencies in describing complex questions related to business with the use of analytic models and data visualization. Students will also learn the ins and outs of business ethics related to decision making. Texas Tech University is often called Texas Tech, Tech, or TTU and is a public university, situated in the town of Lubbock Texas. They first materialized as an university in February 10, 1923, and were known as Texas Technological College. It is the flagship location for the Texas Tech University system, which is comprised of three additional schools. The Carnegie Foundation has classified TU as The Highest Level of Research, and the fields of research are vast in reach, with topics including epidemiology, grid computing, atmospheric sciences, and wind energy. They are known for having a gorgeous campus, and were awarded the Grand Award for Excellence in Grounds Keeping, and having one of the best public art collections in the US. Texas Tech University is the home to Rawls College of Business, the entity that hosts the residential Master of Science in Data Science. This STEM designated graduate program is distinctly one year in length, consisting of 12 classes. Using the foundations of statistics, business, and technology, students will learn how to interpret big data, and use their understandings to contribute strategy solutions to businesses. For applicants that have a minimum of five years of comprehensive and relevant work experience the GRE/ GMAT scores can be waived. There no essay requirement for the Rawls College of Business, but students will still have to complete the general graduate school personal essay. Worcester Polytechnic Institute, also known as WPI, is a private research University in Worcester, Massachusetts. They have an institutional focus on the instruction and research of the technical arts and applied sciences. WPI was one of the early universities in the US to focus on engineering and technology, and was incepted in 1865. Currently, they offer 14 distinct academic departments including 50 undergraduate and graduate degree programs. They are not only known for research, but the way in which it is conducted. Many faculty members work with students on extensive research projects in a myriad of disciplines, including biotechnology and information security. Worcester Polytechnic Institute offers an exceptional residential graduate program in Data Science. As per WPI’s legacy in experiential learning, students in this cutting-edge program work together, and with faculty who are experts in the field, to decipher large quantities of data, and grow the skills to apply findings to strategy building efforts, and gleaning solutions to complex problems. The program consists of 33 credit hours, and comes together at the end with a Graduate Qualifying Project (GQP), which is a semester long project, done in teams, and in tandem with an industry partner. WPI alumni and students are waived from the GRE requirement. The University of Illinois at Chicago is often referred to as UIC, and is a state funded research-intensive university, in the category of “high research.” The campus is situated in the Near West Side Community area, just facing the Chicago Loop. It is the largest post-secondary institution in the Chicago Metro Area, with enrollment at close-to 29,000 students, enrolled in all 15 UIC Colleges. UIC is known for being the home of the largest medical school in the nation, with over $412 million in research consumption. On campus is the UIC Pavilion, which is where many events occur including concerts and basketball games. The University of Illinois at Chicago offers the innovative Liautaud Master’s of Science in Business Analytics. This residential graduate program is bringing students up to speed in the evolving industries that require Big Data experts. Students of the program will receive an in depth education in data interpretation and organization, technology that functions to integrate the underpinnings of financial accounting and marketing, and visual interpretation methods. This rigorous curriculum is fast-paced, as the 32 required credit hours can be completed in one year with a full-time status. Students will gain hands-on technological skills, and will work with tools such as Python and SAS. Santa Clara University, which is also referred to as simply Santa Clara, is a private Jesuit institution located in Santa Clara, California. Established in 1851, they are the oldest operating post-secondary institution in the state of California, and has been in the same location for 166 years. Their scenic and historical campus surrounds Mission Santa Clara de Asis, which was founded in 1776, and Santa Clara has emulated it’s architectural style. They are known for being a top producer in Fulbright Scholars, and have also produced Rhode’s Scholars. Their decked out in red and white sports teams are called the Broncos. Santa Clara University is the home of the Leavey School of Business, who parents their well-respected residential Business Analytics program. This Master’s in Science degree program is a response to the ever growing fields that are demanding skilled data analysts, and what better place for the university to be, but the Silicon Valley. Full time students in the program are on the fast track to completing their degree in only 15 months, and the part time program, designed professionals in the field can be completed in as little as 24 months. The coursework includes a 5 quarter STEM approved practicum, giving students hands-on professional experience. The University of Oklahoma, colloquially referred to as UO is public research institution located in Norman, Oklahoma. Established in 1890, prior to the existence of the state. At the time of it’s inception it was built beside Indian Territory, for 17 years prior to Oklahoma’s statehood. It was calculated in the fall of 2016 that there were over 31,250 students enrolled at the university, primarily at the main Norman campus. They have nearly 3,000 faculty members to accommodate the high level of student enrollment and research activity. UO is ranked number 1 among public universities for enrollment of National Merit Scholars. The University of Oklahoma’s Gallogly College of Engineering offers a residential graduate program in Data Science and Analytics. This Master’s of Science degree program is demanding and fast-paced, as students become graduates in as little as 14 months with full-time status. Part-time options of study are also available. The classes are meant to meet the student where they are at, and therefore, they offer online and hybrid options as well. Following the completion of all core courses, students are then expected to participate in a comprehensive practicum, as they expect students to employ course competencies to the organizations for which they are placed. The University of Chicago, also known as U of C, Chicago, or UChicago, is a private research institution, founded in 1890. It holds many top 10 places in national and international rankings. Located in the epicenter of bustling Chicago, students have all of the resources that this international city has to offer at arms length. Not only do they offer extensive undergraduate and graduate programming, they are also known for being the home of many professional schools, including the Pritzker School of Medicine, the Booth School of Business, the Law School, the School of Social Service Administration, and the Harris School of Public Policy Studies. The University of Chicago’s Graham School for Continuing Liberal and Professional Studies is the home to the residential MSc Program in Analytics. This apropo graduate program takes students to the cutting edge of big data management and analysis, and imparts the skills to apply research to business solutions, with analytic tools. Another critical skill that is covered in the program is ethical communications and leadership strategies. The program is designed for professionals who already have experience in a variety of fields including information technology and computer science as as well as social or biological sciences. This could also be a good fit for recent college graduates who have studied social or physical sciences, and are interested in entering the field of data analytics. The University of Connecticut Hartford Campus, is also called (UConn Hartford), sits in the downtown region of the state’s capital. They are known for the many academic and and hands-on service and educational opportunities, many of which take advantage all that the city of Hartford has to offer. This fairly new location is integrated into the city’s resources, as they hold connections to the public library system, the Wadsworth Atheneum, and the Connecticut Science Center. They have a total of 3,100 students enrolled, and 300 faculty and staff. Their close 32 mile proximity to the Storrs campus gives students easy access to more inter-campus resources. One of the exciting offerings that the University of Connecticut Hartford Campus has to offer is the residential graduate program in Business Analytics and Project Management. This Master’s in Science Program degree program is offered through the School of Business, and can be taken on a full time or part time basis. This course of study provides students with the necessary skills to be make data driven interventions for and with small businesses and large corporations to solve complex problems, and create new opportunities. Project Management is a key component to this program, giving students a broad foundation in the discipline and connecting it to data interpretation and analysis. Georgia Tech, as this iconic institution called by those who know it well, was founded in 1885 as a part of plans for reconstruction of Atlanta after the Civil War. Originally named Georgia School of Technology, most things about Georgia Tech have evolved with the times. Since their inception, Georgia Tech has gone from offering only mechanical engineering degrees, to at the turn of the 20th century offering electrical, civil, and chemical engineering, to finally offering the plethora of degrees and focuses that have made it consistently ranked in the top 10 universities in the country. Whether it is their exemplary and highly regarded academics, or their consistently top ranked collegiate athletics– the Georgia Tech Ramblin’ Wrecks–people know this institution well, and for well-deserved reasons. The Georgia Tech Master of Science in Analytics will take students through a graduate program that will prepare them for an illustrious career working in Big Data, with an degree that is designed to be completed in one year, with a total of 36 credit-hours required for each student. Georgia Tech’s world class faculty offer residential graduate students three tracks through the program, the Analytical Tools Track, the Business Analytics Track, and the Computational Data Analytics. The differences in these three being the areas of focus the student hopes to achieve upon graduation, so students should be selective in deciding between these tracks, as the curriculum is very different. The Rensselaer Polytechnic Institute, also known as RPI, is a private research and space grant university, located in Troy New York, with additional campuses in Hartford and Groton, Connecticut. Founded in 1824, by Stephen Van Rensselaer and Amos Eaton for explicit purpose of “the application of science to the common purposes of life.” RPI is thought to be the best technological university in the english speaking world. As of 2017 Rensselaer faculty and alumni include 6 members of the National Inventors Hall of Fame, and six National Medal of Technology winners, as well as eight Fulbright scholars and one Nobel Prize winner in Physics. The Rensselaer Polytechnic Institute is responding to the fact that all successful businesses and corporations in the current technologically advanced era require highly skilled data analysts to be on hand. Students of this well received program will gain skills to be leaders in the field with foundational statistics, business concepts, and data management. Students are given the opportunity to select electives tailored to their professional goals. RPI has the luxury of small class sizes, giving students the opportunity to build strong peer relationships, and have access to faculty members. One of the crowning jewels of the program is the capstone course, engaging with industry partners. There are also many embedded opportunities for mentorship from the active board of executives in the business analytics industry. Northwestern University, which is often referred to as NU or simply Northwestern, is a private research institution in Evanston, Illinois, and has additional campuses in neighboring Chicago, and Doha, Qatar. They also offer academic programming with facilities in Washington D.C. and San Francisco, CA. The school was founded by John Evans, whose vision was to serve the Northwest Territory, which today includes Ohio, Indiana, Illinois, Michigan, Wisconsin, and parts of Michigan. NU is known for being highly competitive, as illustrated by the 9.0% acceptance rate in 2017, having received over 37,000 applications. One of the schools for which they are known is their Kellogg School of Management. Northwestern has one outstanding residential Big Data Graduate program in Analytics, that is housed in the McCormick School of Engineering. Northwestern recognizes the hyper-competitive nature of this field, and encourages and supports making industry connections while still learning the skills to become an industry leader. With a blend of instruction from renowned professors and lecturers from major corporations, students of Analytics graduate program at Northwestern can trust that not only will the instruction they receive be on the cutting edge of industry practices, they will also have the opportunity to apply their skills to current industry-inspired projects, solving problems alongside professionals in the field. After all, nothing says “hire me!” like helping solve problems in a company before you even finish school. The University of Massachusetts at Amherst is also known as UMass Amherst, UMass, or simply Massachusetts. It is the flagship campus for the UMass system, and is a public land grant and research institution. They are the largest public university in the state, with more than 29,000 students enrolled, and close to 1,300 faculty members. This research University falls under the category of Highest Research Activity, ranked by the Carnegie Foundation for the Advancement of Teaching. The US News and World Report ranked Amherst in the Top Ten Best College Towns in the United States. Their sports teams are called the Minutemen and Minutewoman, with maroon, black and white colors. UMAss Amherst’s College of Information and Computer Sciences offers a well respected residential graduate degree program in Data Science. This Master’s In Science degree program can be completed with 30 course credits many of which fall under the Data Science Course Requirements with a B grade or better. Some of the course offerings include: Natural Language Processing, Machine Learning, Data Visualizations, and Advanced Algorithms. There are many elective options for students to take in order to fulfill the elective requirement, and outside courses will be considered, though they must be pre-approved. In order to graduate, students must maintain a GPA of 3.0 in the 30 credit hours. Michigan State University, also referred to as MSU, is a public research university situated in East Lansing, Michigan. It was founded in 1855, and became a model for land-grant universities created under the Morrill Act of 1862. Originally MSU was established as Agricultural College of the State of Michigan, one of the first institutions in the country to teach scientific agriculture. They were also one of the first institutions to offer programming in packaging, hospitality business, supply chain management, and communication sciences. They have one of the largest numbers of enrolled students, approximately 55,580, from all disciplines and degree denominations. Michigan State University’s Eli Broad College of Business offers a residential graduate program in Business Analytics. This Master’s in Science degree program has the tagline “Building Intelligence in a Data Driven World.” It is a rigorous three semester course of study designed to train students to be leaders in the growing fields of data management process and foundations in business analytics. Students are given hands-on project management opportunities, with access to live data sets and opportunities for application of analysis. Students will also have opportunities to build expertise in are such as: Data Mining, Applied Statistical Approaches, How to Interpret and Communicate data Analysis, and Social Network Analytics and Marketing Technology. Case Western Reserve University is also known as Case Western, Case, and CWRU. It is a private institution situated in Cleveland, Ohio, and was established in 1967 by the Federation of Case Institute of Technology in partnership with Western Reserve University. Time Magazine commented on the merger, by calling it the creation of “Cleveland’s Big Leaguer University.” The US News and World Report ranked CWRU’s undergraduate program 37th among national universities. The Wall Street Journal/ Times Higher Education ranked CWRU as 32nd among all universities, and 29ths among private universities. An interesting fact is that the institution is associated with 17 Nobel laureates. Case Western Reserve University’s Weatherhead School of Management offers a residential graduate program in Management and Business Analytics, and it is this highly acclaimed institutions newest program. This Master’s in Science degree program qualifies as a STEM-eligible program, making way for international students in a technical field to apply for a 24-month extension to their optional training program (OTP). The course of the 33 credit hour program can be completed in 11 months with full-time status. This program stands out from others as it highlights the highly in demand professional track of analytic skill mastery, as applied to marketing and interdisciplinary training. Illinois Institute of Technology, also known as Illinois Tech, or IIT, is a private research doctoral institution located in Chicago. It’s programs include: engineering, science, architecture, business, communications, industrial technology, information technology, law, and design. IIT follows the legacy of several 19th century engineering and professional education institutions in the US. What is now known as “the Million Dollar Sermon,” delivered by minister Frank Wakely Gunsaulus in 1890, who referred to the fact that advanced education was generally reserved only for the most societally elite, and he said that with one million dollars we could build a technical school that would offer high quality technical educations to students from all backgrounds, in an effort to change industrial society. This sermon was the foreshadowed event of the founding of Illinois Tech. Illinois Institute of Technology offers a residential graduate program in Data Science, driven by their College of Science. This Master’s of Science program prepares students for leadership roles in the many STEM related fields involving “Big Data.” This is a mathematics and statistics centered course of study with high level data analytics incorporated into the coursework geared at solving complex business related questions of our times. Students are also given opportunities to practice high level data visualization techniques aimed at communicating data issues with real world language and scenarios. The full-time program is delivered at the Miels Campus, only minutes away from the Chicago Loop. Part-time students are given the opportunity to take their coursework online. North Carolina State University, also known as NCSU, NC State, or simply State, is a public research institution situated in North Carolina’s Capital city, Raleigh. This institution is a land, sea, and space grant institution. NC State makes up one of the corners of what is known as “the research triangle,” with the other corners being Duke University, and The University of North Carolina, at Chapel Hill. Established in 1887, as a land-grant college, NC State was founded as the North Carolina College of Agriculture and Mechanical Arts. More than 34,000 students are currently enrolled, making it the largest post-secondary institution in the Carolinas. It is no surprise that North Carolina State University’s Institute for Advanced Analytics offers a powerful residential graduate program in Analytics. This Master’s of Science degree granting program is dedicated to creating leaders in the professional leaders in the STEM related fields that require data analytics experts to be successful. An interesting fact is that this degree program offered at NC State is the first of it’s kind in the nation. The Harvard Business Review named the Institute for Advanced Analytics, among the best, and one of the only few sources of talent and strength in the business analytics field, along with MIT, Stanford, Berkeley, Harvard, and Carnegie Mellon. Purdue University is touted as Indiana’s Land Grant University. Founded in 1869 by West Lafayette businessman John Purdue, the university has been a touchstone in research and engineering for many international, governmental, and private enterprises for a century and a half. They now are known far and wide for their research, their contributions to the military and national security research, their athletics teams known as the boilermakers, their online writing lab (OWL), which was launched in 1994 and is available freely online to all. The OWL and includes handouts, information on subject areas, resources geared towards students in grades 7-12, and citation formatting help for MLA, APA and more. The Master of Science in Business Analytics and Information Management at Purdue’s Krannert School of Management is a full-time, 11-month program beginning in June every year, and is focuses on developing the skills of information technologies and analytical techniques. Students with benefit greatly from the Business Information and Analytics Center within the Krannert school, a data-focused project center that centers the acquisition and analysis of Big Data initiatives. It is these and other bold plans to give students a cutting edge educational experience that makes Purdue a leader in STEM-based business education and research. The residential Masters in Business Analytics and Information Management program takes students with a strong STEM background and gives them the skills to excel in the field of Big Data. The Krannert School of Management is one of the best business schools in the nation, public or private, according to U.S. News & World Report, with an incredible job recruitment record for graduates. Louisiana State University at Baton Rouge is also known as LSU, and is technically called Louisiana State University and Agricultural and Mechanical College. This public, co-educational university is located in Baton Rouge, and was founded 1853. Originally called Louisiana State Seminary of Learning and Military Academy, LSU is now the flagship school in the Louisiana State University system. In 2017, they had over 25,000 undergraduate, and over 5,000 graduate students enrolled in their 14 schools and colleges. Many of their graduate internal institutions have received national recognition for their various disciplines. They have also become known for their exemplary research facilities. The Louisiana State University’s E.J. Ourso College of Business offers a residential graduate program in Analytics. This Master’s in Science degree program’s parent organization is the Stephenson Department of Entrepreneurship and Information Systems, in partnership with the Department of Experimental Statistics, as well as the Department of Marketing. This multi-faceted course of study imparts the knowledge of data driven methodology as a critical contribution to organizational decision making and effectiveness. Business analytics and business intelligence are key competencies that are explored, as well as employing the tools of information technology to solve large scale problems that impact business operations. The University of Texas at Dallas, also known as UTD, or UT Dallas, is one of the outstanding institutions that make up the University of Texas System. Their main campus is located in Richardson, Texas, in what is known as the Telecom Corridor, just 18 miles from downtown Dallas. Founded in 1961, as the Graduate Resource Center of the Southwest, and later named The Southwest Center for Advanced Studies (SCAS), which began as a research arm of Texas Instruments. The Carnegie Foundation Classifies UTD as the offering the Highest Level of Research, as well as considering undergraduate admissions “More Selective.” Notable faculty and members of the alumni have received the Nobel Prize. UT Dallas offers a residential graduate degree in Business Analytics, a Master’s in Science degree granting course of study. This MS BUAN is a STEM-degree program that can be completed in 18-24 months at the Naveen Jindal School of Management. Students that participate in this course of study achieve access to the most cutting-edge “Big Data” education, with core courses that carve out a foundation in successful business analytical techniques, as well as data visualization. Graduates are prepared to have careers at the front lines of Data Science and Marketing. Students have many elective options including Decisions and Operations Analytics, Data Science, Financial Analytics, Healthcare Analytics, and IT Analytics. Stevens Institute of Technology, also known as SIT, is a private research university located in Hoboken New Jersey, with a satellite location in Washington D.C. Established in 1870, it is one of the earliest technological universities in the nation, and was one of the first colleges in the United States with a single focus on mechanical engineering. Current enrollment consists of more than 5,000 undergraduate and graduate students, which represent 47 of the 50 states, and 60 countries including the continents of Asia, Europe, and within Latin America. SIT is also home to national centers of the US Department of Defense, and the US Department of Homeland Security. Stevens Institute of Technology offers a residential Business Intelligence and Analytics Master’s of Science Program geared towards innovative practices of data analysis and interpretation of large amounts of complex data. Students are given the foundational skills to use data to create organizational transformation. The curriculum is said to promote the skills needed to the “big data revolution,” and includes key competencies such as: data warehousing, data and text mining, social network analytics, optimization, risk analytics, and technological platforms, such as Hadoop and Data Stream Analytics. This program was ranked number seven of its kind in the US, in the TFE Times, this second year of which it placed in the top 10! The University of San Francisco, also referred to as USF, is a Jesuit Catholic university in the heart of San Francisco. The main campus offers a 55 acre setting, between the Golden Gate Bridge and gorgeous Golden Gate Park. The nickname for this main campus is “The Hilltop,” and a portion of this main campus is located on one of San Francisco’s major geographical features called Lone Mountain. This renowned institution offers classes at several other locations, and actually started as a small one room schoolhouse on Market Street, in 1855, before that area became the city’s downtown. 1859, is when they were accredited to start issuing degrees. The University of San Francisco’s College of Arts and Sciences offers a residential graduate program in Data Science. This Master’s of Science in Data Science (MSDS) degree granting program can be completed in as little as one year with it’s fast-paced curriculum that focuses on computation and mathematical fundamentals, that are critical components in the growing data driven disciplines. 98% of the MSDS graduates are gainfully employed within three months of graduation, many of which work for Google, Amazon, Williams-Sonoma, Mozilla, Capital One Labs, and Eventbrite. One of the exciting aspects about the program is the practicum requirement giving students valuable work experience, for approximately 15 hours per week, over the course of 9 months, where they tackle big world data science and analytics with companies notable in the San Francisco Bay Area. Carnegie Mellon University, is also referred to as CMU, and is a notable research university, located in Pittsburgh, PA. Established in 1900, by founder Andrew Carnegie, with the original name the Carnegie Technical School, in 1912 it became known as the Carnegie Institute of Technology in 1912; from that point on they began granting four year degrees. CMU has a 140 acre main campus, just 3 miles from the Pittsburgh’s center. They have seven colleges and independent schools, which include the College of Engineering, the College of Fine Arts, and Dietrich College of Humanities and Social Sciences, Mellon College of Science, Tepper School of Business, H John Heinz lll College of Information Sciences and Public Policy. Offered by Carnegie Mellon University’s Heinz College is the residential Master’s in Computational Data Science/ Business Intelligence and Data Science. The course of study is comprised of a synthesis of technology and business related classes, framed as a vehicle for a successful career in information systems management. This graduate program is a rigorous three semesters in length, with on campus coursework that brings together the interdependencies of strategy, technology, and management. After 16-months, students will be eligible for graduation, and ready to re-enter the workforce as leaders in the field. Participants in the program are required to take a projects course revolving around one of the programs specializations, which will prepare students to take their ideas from academia to the workforce. Oklahoma State University, which is also referred to as OKstate and OSU is a land and sun grant institution situated in the town of Stillwater, Oklahoma. Established in 1890, under the Morrill Act, it was originally referred to as the Oklahoma Agricultural and Mechanical College (Oklahoma A&M). It is the flagship institution for the Oklahoma state University system. The freshman class of 2012 was the largest class on record with 4,298 students. The Carnegie Foundation has classified OSU with High Research Activity. The Princeton Review has ranked OSU as one of the 120 Best Western Colleges for 2011. Oklahoma State University’s Spears School of Business, offers a residential graduate program in Business Analytics. This hands-on Master’s of Science program offers experiential learning opportunities for students to grasp data analysis in a multi-platform environment, including access to SAS tools, and other programming languages such as Python and Tableau. This innovative program also emphasizes business development skills and communications. An exciting fact is that 90% of program graduates in 2017 received job offers within three months of completion, with an average annual salary above $80,000, with additional signing bonuses. Also, 100% of students received summer paid internships in the summer of 2017. George Mason University, also known as Mason is the largest public research institution in the nation. Established as a University of Virginia Branch in 1942, it became an independent university in 1972. They have four Virginia Based campuses and one located in Songdo, South Korea within the bounds of the Incheon Free Economic Zone. The university is the home to 500 student groups and 41 sororities and fraternities. The Nobel Memorial Prize in Economics was won by two faculty members. Between 2009-2013, they received a 21% increase in the number of submitted applications, and has enrolled 4% more degree seeking students. George Mason University’s Volgenau’s School of Engineering offers a residential graduate program in Data Analytics Engineering. This Master’s in Science degree granting program gives students the conceptual and technical skills for data driven decision making. Topics that are engaged in the core course work are: data mining, statistical models, optimization, data visualization, and risk analysis. This course of study is perfect for students who are inclined to enter the field of data science in a leadership role. Students will also be able to delve into topics that support their individual professional goals like digital forensics, business analytics, and financial engineering. The University of North Carolina at Charlotte, is also known as UNC Charlotte, and is a public research university offering 140 undergraduate degrees programs, 64 Master’s degree programs, and 23 Doctoral. UNC Charlotte has three distinct campuses: Charlotte Research Institute Campus, Center City Campus, and the main campus located in University City, and sits on 1,000 wooded acres, just 8 minutes from Uptown Charlotte. UNC Charlotte is the largest postsecondary institution in the Charlotte region, which is the third largest banking center in the nation. UNC Charlotte has grown 33.3% in enrollment in the past ten years, which translates to the fastest growing institution in the UNC System. UNC Charlotte offers a residential graduate program in Data Science and Business Analytics. This Master’s of Science program is an interdisciplinary course of study that synthesizes operations research, information sciences, data science, and statistics. Students are given the innovative data driven skillset that is more and more in demand in today’s world, and they are therefore prepared to work in the data-intensive fields that include financial services, retail/ supply chain, and healthcare. Classes are taught in the evenings at the Center City Uptown campus, and the program can be completed with full time or part time status. A practicum is required for graduation, giving students the opportunities to work first-hand with leaders in the field. The University of Cincinnati, colloquially referred to as Cincinnati or UC, is a public research institution, and part of the University of Ohio system. Established in 1819 as Cincinnati College, it is the oldest post secondary institution in the nation. It is the second largest university in Ohio, and one of the 50 largest institutions in the United States, with 44,000 enrolled students. They were ranked by Times Higher Education in the category of top 100 universities in North America, and top 250 in the world. The US News and World Report followed suit tanking UC within the top 200 universities in the world. The University of Cincinnati’s Carl H. Lindner College of Business offers a residential graduate program in Business Analytics. This Master’s in Science degree program gives students a competitive foundation in predictive, descriptive, and prescriptive analytics, which most-likely why this program has been consistently ranked within the top 10 Business Analytics Programs in the United States. This ranking is illustrated by the fact that so many graduates are in leadership positions at companies such as google, Disney, Proctor and Gamble, and Facebook. One of the program highlights is that corporate partners present seminars and recruit students on an almost weekly basis. The University of Texas at Austin is also known as UT, UT Austin, or simply Texas. It is a public research institution, and the flagship of the University of Texas System. Established in 1881, this large campus is located less than one mile from the Texas state capitol building. As Texas would have it, they are the eighth largest student body in the country, with over 50,000 graduate and undergraduate students enrolled, and 24,000 staff and faculty. They are known as a major hotbed for academic research with expenditures with funds over $550 million for the 2014-2015 school year. One of University of Texas’ exemplary programs is the residential Master’s in Business Analytics. This graduate offering is STEM certified, and embedded with a tremendous amount of support and industry leader recruitment from companies including Walmart and Deloitte Consulting. Networking is also a critical component of the program, as many bridges are built with industry leaders, and the career development team helps support students with this trajectory. This multi-faceted program is designed to be completed within a 10 month period. This course of study is open to students who have majors in different disciplines, but it is highly recommended that applicants complete coursework in Statistics, Probability and Calculus prior to applying. The University of New Hampshire at Durham (UNH) is a public research university in the University of New Hampshire System. Situated in the Seacoast region of the state, Durham’s campus is the parent to six colleges. Established in 1866 as a land grant college in Hanover, in connection to Dartmouth, In 1893 UNH moved to Durham. UNH is the largest university in the state, and is one of only nine in the country that are land, sea, and space grant institutions. There are over 15,000 students enrolled between the Durham, Manchester, and Concord Campuses. UNH is a member of the New England Board of Higher Education. The University of New Hampshire at Durham offers a residential Master’s of Science program in Analytics. This is a full-time graduate program that spans three semesters of coursework with an interdisciplinary approach to topics such as: quantitative analysis, critical thinking, reasoning, applications, and analytics. Students are given multiple opportunities to engage with industry partners, and are given the responsibility to use their skills as applied to real-world analytic inquiries. Students are able to declare specializations such as health, business, or self-declared foci. Graduates will be prepared to sit for several SAS qualifications exams. Applications are accepted on a rolling basis, and the programs begin each May. The University of Rochester, which is also known as U of R, or simply Rochester is a private, nonsectarian research university, located in Rochester, New York. This institution offers six schools with a wide variety of interdisciplinary programs, all of which grant undergraduate, graduate, doctoral, and professional degrees. U of R is known for many key features, including it’s Eastman School of Music, and the resident Institute of Optics, which happens to be the first educational institution dedicated to the discipline of optics, and was established in 1929. Rochester also has a laboratory for Laser Energetics, and is the host to the world’s most energetic laser. Within this well-known university is the Simon Business School and the Goergen Institute. The Masters of Science in Business Analytics program at Rochester combines foundational business knowledge with analytical expertise. The latter of these, coupled with an economics-based curriculum, gives students the theories and practical frameworks to be a sought-after analyst. At the Simon School, faculty teach advanced programs like Python, R, and Tableau to help students leverage the Big Data insights that companies need. With an entire chart of co-curricular, career building, and social and networking opportunities built right in, students enter the Masters of Science in Business Analytics program with their sights on their future of success, the support to meet those goals, and the tools to expand their vision even further. The Simon school is located on the University’s River Campus in Rochester, New York. It was renamed after William E. Simon (1927–2000), the 63rd United States Secretary of the Treasury, in 1986. What started as a small business school has grown in the last 60 years to offer a Masters of Business Administration and Executive Masters of Business Administration, a Masters of Science degree with seven different programs students can choose from and an extensive Ph.D. program with a variety of concentrations. The Goergen Institute for Data Science at the University of Rochester offers a residential graduate program in Data Science, with a Master’s of Science accreditation. Students with full-time status can complete the program in as little as two or three semesters. The two semester option is directed towards participants who already have a strong foundation in complex mathematics and computer science, and are equipped to take on an extra demanding course load, which includes four classes per semester, to make way for an expedient start to graduation duration. The three semester model gives students the opportunity to take three courses per semester. Students who are accepted into the program without a strong computer science background, will be required to take a Summer Bridging Course, and will be notified of such in their acceptance letter. Brandeis University is a world renowned private research university located in Waltham, Massachusetts, a mere 9 miles from Boston. Established in 1948 as a non-sectarian co-educational school, with sponsorship from the Jewish Community, they Brandeis was built on the site of the former Middlesex University. The school was named for Louis Brandeis, the first Jewish Justice of the Supreme Court. The 235 acre suburban campus had a total enrollment of 5,532 students in 2015. They have offerings that include 43 majors and 46 minors. Well over half of the courses have fewer than 20 students in attendance, and all classes enjoy the intimacy of a low student to faculty ratio. Brandeis University’s International Business School offers a residential graduate program in Business Analytics. The close proximity to Boston gives students the advantage of being in the hub of financial and business innovation. This Master’s of Science degree granting program is STEM designated, and students have many opportunities to work on faculty mentored Data Analytics Consulting Projects. A benefit of Brandeis is that all admitted students will be considered for generous scholarship opportunities. Applicants are not expected to have prior work experience in the field. The program spans the course of 11 months, and the faculty are well-respected scholars and leaders in the field. Also known as Rutgers, or RU, Rutgers University is an American public research university, which happens to be the largest postsecondary institution in the state of New Jersey. Established in November 10, 1766, chartered as Queen’s College prior to the American Revolution. In 1825, it was renamed Rutgers University, after Colonel Henry Rutgers, NYC Landowner, philanthropist, and former military officer. RU is the eighth oldest college in the United States. Rutgers is the flagship state university for New Jersey. They have 9,000 members of the faculty and 175 academic departments, to support the 45,000 undergraduates, and 20,000 graduates that are currently enrolled. Rutgers University’s residential Master of Business and Science degree in Analytics program is a degree for the times in which we live; one that brings data driven decision making to the table as they develop in prospective leaders in the field the skills to master computer science, statistics, data mining, and machine learning. Students are prepared to immediately enter many industries including: business intelligence, predictive modeling, analytics, and data driven fields such as marketing, finance, biotechnology and healthcare. Prospective students without a background in STEM are encouraged to apply, though it is mandatory that they have at least one year of calculus. There are many opportunities for students to learn more about the program through online or in person information sessions, aimed to determine if one is a good fit. The University of College Park. also known as UM, UMD, UMCP, or simply referred to as College Park, is a public research institution. It is located just four miles from the Northeast border of Washington D.C, in the city College Park in Prince George’s County, Maryland. Established in 1856, this institution is the flagship of the University of Maryland system. The enrollment is 2016 included a total of 29,000 students. They offer over 100 undergraduate majors and 120 graduate programs. UMCP is the largest in the state, including the Washington Metropolitan Area. They are a member of the Association of American Institutions. The University of Maryland’s residential graduate Master’s in Science degree program in Business Analytics is a professional track, providing students with the critical tools to be leaders in the fields of data management. In this era of “big data,” it is critical that the new skillset of data analysis, statistics, computational comprehension, and qualitative/ quantitative decision making. The program is designed to span a 16 month period on a full-time basis. Classes take place on campus in the afternoons and evenings. All program participants are required to take part in a culminating capstone project in teams of 4-5 students, with faculty supervision. The University of Tennessee at Knoxville, also known as UTK or UT, is a public sun and land grant university situated in Knoxville, Tennessee. Established in 1794, just 2 years before Tennessee became the 16th state in the union. UTK is the flagship campus of the University of Tennessee system. Their enrollment is 28,000 students and represents all 50 states and 100 countries worldwide. The US News and World Report ranked UT 103 among all national universities, and 46th among all public universities, in 2017. In their archives, they host collections of papers of all three US Presidents from the state of Tennessee. The Haslam College of Business at the University of Tennessee Knoxville, offers a residential Master’s of Science Program in Business Analytics which is designed to develop students into experts in the fields related to business analytics. Students will gain hands-on experience, including a required internship that takes place in the summer, to work directly in real world scenarios to solve complex business data related problems. They are seeking applicants who have some skills in decoding quantitative knowledge, and a desire to contribute to businesses data-driven decision making. There are many financial aid opportunities, for at least one semester. It is also an almost 100% statistic that graduates had a job directly out of the gate. Fairfield University is a private co-educational undergraduate and graduate level university, nestled within New England’s town of Fairfield, Connecticut. Established by the Society of Jesus in 1942, it is still one of 28 additional member institutions of the Association of Jesuit Colleges and Universities. Fairfield has distinct institutional objectives, which include ethical and religious values, and a sense of social responsibility coupled with the development of the creative and intellectual potential of their students. Their total enrollment is close to 3,500 undergraduates and 1,200 graduate students within all five of Fairfield’s schools. They have been nationally recognized for their accounting, nursing, liberal arts and science programs, which have produced 62 Fulbright scholars, a MacArthur fellow, and a Guggenheim fellow. Fairfield University offers an exciting residential Master’s in Science program in Business Analytics. This graduate program provides students with the highest quality education to bring them into leadership roles in the ever-expanding world of tech. Students will learn key competencies enabling them to gain the necessary skills to analyze big sets of data and apply the findings to contribute to the success of businesses, corporations and organizations. This program is known for it’s flexibility and convenience, as well as its relationships and proximity to Fortune 500 Companies in NYC, and has systematically been nationally ranked as an excellent and relevant program. Syracuse University, also referred to as Cuse, or CU, is a private research institution in Syracuse New York, with a history rooting back to the Genesee Wesleyan Seminary, which then became the Genesee College. Established in 1831, it was a project of the Methodist Episcopal Church, situated in the town of Lima, New York. In 1870, the college decided to undergo transformation, and this independent university in Syracuse was established. In 1920, they became explicitly non-sectarian. Currently, they are located in the University Hill neighborhood of Syracuse, just southeast of downtown. This large campus features many architectural styles, including Romanesque Revival. The School of Information Studies at Syracuse University, also known as the iSchool, offers a residential degree program in Information Management. This program is known for their interdisciplinary approach to the innovative coursework that sets this Master’s in Science degree granting program apart from the others. This course of study brings together many aspects of STEM disciplines with in demand IT Communication skills, design and implementation, along with data analysis. Students will work with faculty who are the top in their field, and bring mentorship based on personal experience. Graduates of the program have found success in many fields including as consultants and analysts, working with some of the largest named companies in tech, and many have begun their own enterprise. Indiana University Bloomington, also known as IU, and often referred to as simply Indiana, is a public research school situated in Bloomington, Indiana. They are both the flagship to the Indiana University System, as well as the largest, with a total enrollment of over 48,000 students. They are considered one of the Public Ivy schools in the country, meaning one of the top public universities in the country, with an education equivalent to that of an Ivy League School. Students attend IU from every state in the country, though 55% are from the state of Indiana. The student body also represents 165 additional countries, as well as Puerto Rico. They are also known for an active student life, with over 750 student run organizations. Indiana University Bloomington has a School of Informatics, Computing and Engineering, which offers the innovative residential graduate program in Data Science. This well-respected program has a 30 credit hour requirement, and aimed at imparting the critical and timely skillset for students to be successful in the evolving fields of data science. Prospective students are not required to have previous experience academically or in the workforce in the fields of STEM, as they make a note of valuing every student’s orientation and experience in this interdisciplinary program. There are options to achieve this program not only as a Master’s in Science degree program, but the Certificate program could be a good path for some students. There are also options to studying in a hybrid format with some in person classroom experience and some online learning. Kennesaw State University is also known as KSU, and is a public research institution with its main campus in Kennesaw Georgia, just 20 minutes northwest of Atlanta. Their secondary campus is located in Marietta, Georgia. They also host classes at a myriad of additional locations including Cobb Galleria Centre, Dalton State College, and Paulding County, which is in Dallas. Their current enrollment is just over 35,000 students, bringing them to the third largest post-secondary institution in the state of Georgia, and within the top 50 largest universities in the United States. Both campuses are in suburban settings, with a total acreage of 581. The Ph.D. in Analytics and Data Science at Kennesaw State University utilizes principles of interdisciplinary approach, in this doctoral program that bridges the divide between application and theory. Both academia and industry are heavily present in the program concepts, as faculty integrate Computer Science, Mathematics and Statistics with applications in Business, Healthcare, Transportation and Public Policy, preparing the next generation of Data Scientists. Some of the projects that doctoral students are working on in the Kennesaw State residential Doctoral Big Data program are aimed to improve processes in sales and marketing of online programs, bringing new insights in the field of healthcare such as identifying better strategies in vaccination distribution both in the U.S. and in developing countries, analyzing patterns of crime and weather to see how the two are related, finding ways to attract and sustain engagement of underrepresented groups in the STEM fields and many, many others. With faculty who hold a U.S. patent in an algorithm developed for one of these very projects, PhD students at Kennesaw State are changing the world of Big Data. The University of Alabama in Huntsville was just a simple extension center for the University of Alabama until 1961; beginning in 1950, classes were held in the local high school. The change came with NASA – the Marshall Space Flight Center turned Huntsville into “Rocket City,” making a small Alabama city into the center of the space program with the largest NASA site in the nation. NASA called for a public research university to tend to the educational needs of their engineers and managers, and the humble UA Huntsville Center, almost overnight, became the University of Alabama in Huntsville, a major STEM research institution. Even now, UAH is ranked by U.S. News as a top-tier national university, and the Carnegie Foundation recognizes UAH as one of the most productive research universities in the nation. UAH, then, is an ideal place for a world-class Big Data degree program, and the UAH residential MS in Management Science-Business Analytics fits the bill. The UAH College of Business has been recognized by both the National Security Agency and the National Science Foundation for their fusion of technology and business, and the MSMS-BA focuses on the application of data analytics to business. This program is primarily designed for working professionals who want to learn to make the best use of the tons of data available today, and practice using that data to meet customer needs. With a 30 credit program, full-time students can complete their MS in as little as one year, and with UAH’s best value ranking from U.S. News and the Princeton Review, students can be sure they’re getting a deal. A private research university in Dallas, TX, Southern Methodist University came about almost by chance. The city of Dallas, which was growing into a major metropolitan area, had attempted to attract another college to the city, hoping to establish an institution in Dallas similar to the Southern Ivies (like Houston’s Rice University). That attempt was unsuccessful, but the Methodist Church wanted to open a university in the area. It was a fortunate choice; as Dallas’s population and economy boomed, SMU’s access to Fortune 500 companies, finance, technology, and other industries helped make it one of the leading institutions in the nation for business and technology, ranked near the top 50 national universities by U.S. News & World Report. With top-ranked STEM and business programs – including the Cox School of Business, one of the most selective and prestigious in the US – SMU is an ideal location for Big Data. In fact, Southern Methodist offers two data-related master’s degree programs. The Department of Statistical Science at SMU offers the MS in Applied Statistics and Data Analytics, while the Cox School offers SMU’s MS in Business Analytics. These two programs come at the Big Data field from two different angles. The MASDA approaches data from the technical standpoint, preparing students for the hard mathematics and computational demands of data analysis. The MS in Business Analytics, on the other hand, focuses on the organization, processing, and interpretation of data for business purposes. Both carry the SMU reputation in Dallas and around the world, making either a best value investment in a Big Data degree.